This s’mores bars recipe is perfect for summer! The graham cracker dough hugs marshmallow fluff and thick chocolate bars. Each bite is oozing with flavor—it’s better than real s’mores! I’m so looking forward to summer! Not only so I can enjoy all the sunshine, but also so I can treat myself to all the s’mores treats! Made with a graham cracker dough, marshmallow creme and thick chocolate bars, this dessert will have you feeling like you’re right next to the campfire. Growing up, I was never a fan of marshmallows. I would have the occasional fluffernutter (peanut butter fluff sandwich), but I wasn’t the type to eat marshmallows straight from the bag. I was, however, I huge fan of s’mores. Something about melted marshmallows was way better than a regular old mallow. This thinking would explain why I wanted to make these s’mores bars! These bars are the epitome of a s’more minus the campfire. You have your gooey marshmallow fluff, thick chocolate bars and graham cracker dough to hold everything together! In order to satisfy my love for a good melted mallow, I used marshmallow creme. And to satisfy my chocolate craving, I used XL chocolate bars. Every s’more deserves a nice thick chocolate layer if you ask me! To make each graham cracker layer even, I suggest lining your baking pan with parchment paper and create the top layer first. Set it aside, then create your bottom layer. Watch the recipe video and it will make sense! Whether it’s summer where you are or not, these s’mores bars will definitely get you in the summer mind set! This s'mores bars recipe is perfect for summer! The graham cracker dough hugs marshmallow fluff and thick chocolate bars. 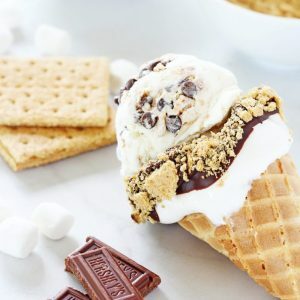 Each bite is oozing with flavor, it's better than real s'mores! Preheat the oven to 350° F. Line an 8-inch by 8-inch baking pan with parchment paper and set aside. In a large bowl using a hand mixer (or stand mixer), beat the butter, brown sugar and granulated sugar together until light and fluffy, about 1 minute. Mix in the egg and vanilla until combined. With the mixer on low, slowly add in the flour mixture and mix just until incorporated, about 20 seconds. Add in the graham cracker crumbs and stir just until combined, about 10 seconds (either with the mixer or by hand). Bake at 350° F for 30 minutes or until golden brown on top. Let cool completely for best serving results. Refer to the recipe video for visual demonstration of creating graham cracker layers. I suggest flipping the top cookie layer upside down then peeling off the parchment paper. This will create a smoother top layer (refer to the video). I make something similar to this recipe (always glad to have another version). My family and friends love love these. I’m so happy you like the recipe! Enjoy! 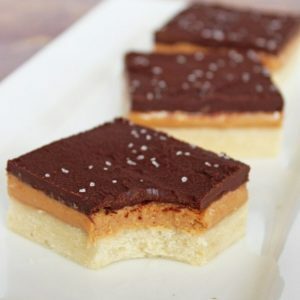 What a delicious indulgent recipe!! Marvelous! Easy to make and just perfect! I have so many wonderful memories making s’mores! Love that you made them into bar form. They look delicious! WOW these s’mores bars are simply genius! 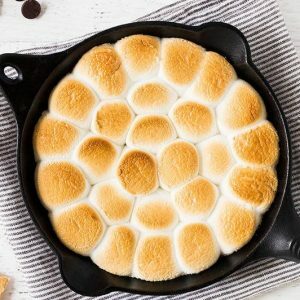 I love the idea of making it this way – unique and less messy than regular s’mores 🙂 YUM! I have never had smores, but I am thinking I am seriously missing out. These bars look like the perfect afternoon treat. Yum Yum Yum! Cannot wait to try this! Love! I bet those flavors are amazing! This is absolutely fantastic! I’m sure this is very tasty. THANK YOU! Oh my goodness do these look beyond amazing! I make something similar, but am looking forward to trying your delicious S’mores bars!! Your pics are so gorgeous! I chose this recipe over a similar one based on reviews displayed on google. Regrettably, I didn’t realize almost all the reviews commented on how “good” the recipe LOOKED and they hadn’t even made it! To make a long story short, recipe makes half the amount of cookie dough required for 8×8 in pan and I’m sad to have wasted my time and ingredients trying to make this. We dont have grahams crackers over here(uk). What are they please so i can find an alternative. I have to try this recipe. It looks so yum. Hi Kat! Digestive biscuits are a good substitution for graham crackers. Enjoy! I bought a box of graham cracker crumbs. How much will I need to equal the six graham cracker sheets listed in the recipe? Also, will semi-sweet chocolate bars melt just as well for this recipe? Thank you. These sound delicious!!! Hi Barbara! Six graham cracker sheets is about 3/4 cup plus 2 tablespoons crumbs. I recommend using a kitchen scale to measure the crumbs. It is 93 grams. Hi love your recipe. Please let me know if they freeze well. I need to start baking ahead if possible. Love this recipe. Can they be frozen? Hi Judy! I have not tried freezing these bars. I believe they will freeze well, just make sure they come all the way to room temperature before eating as the chocolate and marshmallow fluff will be hard!